The Super Bowl’s 50th Anniversary was a defensive showdown between the Denver Broncos and the Carolina Panthers. The Broncos came into the game with the number one ranked defense and had a tall task to contain the MVP Cam Newton and the high-scoring Panthers. The Broncos created pressure from all sides, making Cam Newton uncomfortable and nonexistent in their 24-10 victory. The Carolina Panthers came into the game as the favorites to hoist the Lombardi Trophy. The Panthers high-octane rushing attack, combined with their resilient defense, dominated the NFC on their way to the Super Bowl. The Broncos received the ball to begin the game and quickly drove down the field before the offense stalled and settled for a field goal. This was the first time the Panthers had trailed their opponent in the postseason. The Panthers offense showed signs of nervousness early, before settling in mid-way through the first quarter, but the Broncos defense looked ready and battle-tested. The first touchdown of the game came from a strip sack by Von Miller and recovery by Malik Jackson in the end zone, extending the Broncos’ lead 10-0. The Panthers found composure on the second drive by running the football all over the Broncos defense. The Panthers seemed to find an offensive rhythm, capping the drive off with a Jonathan Stewart leaping touchdown. Jordan Norwood ended the field position battle on an explosive punt return and settled the Broncos offense up inside the red zone. The Panthers defense made a stand, holding the Broncos to another field goal. 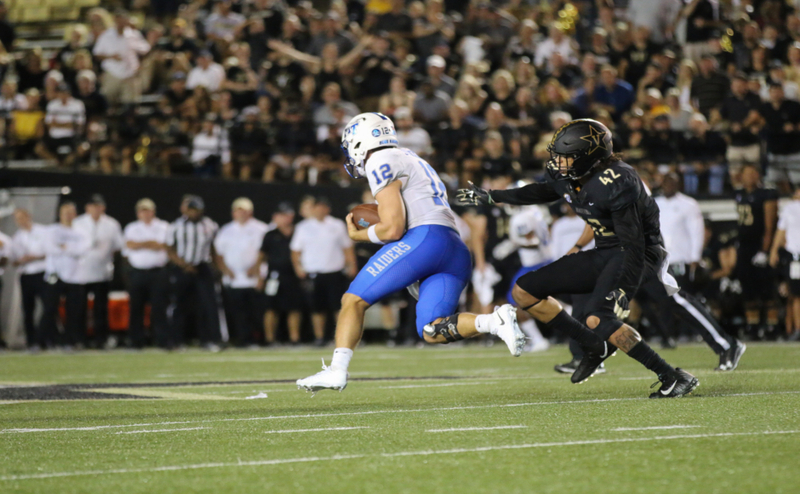 The Panthers received the ball to begin the second half, hoping to put much-needed points on the board, but the Broncos defense continued their dominance into the second half. Miller and Demarcus Ware continued to frustrate Newton by taking away his check down options and applying pressure. Even with all the Panthers offensive struggles, they trailed by nine heading into the fourth quarter. The Panthers defense came up big early in the fourth quarter, stripping Peyton Manning, which lead to a Graham Gano field goal. The Panthers found themselves with the ball and a chance to drive the length of the field to take the lead, but another strip by Miller of Newton gave the Broncos the ball within the Panthers 10 yard line. CJ Anderson surged across the goal line, followed by a two-point conversion from Manning to Bennie Fowler, to give the Broncos a 24-10 lead with over three minutes left. Newton finished 18-of-41 for 265 yards with one interception and two fumbles while rushing for 45 yards. Manning finished 13-of-23 for 141 with one interception and one fumble. Anderson had 23 carries for 90 yards and the only Denver offensive touchdown. Overall, there were 12 combined sacks and six turnovers. The Denver Broncos secured their third title in eight tries. Manning became the most winning quarterback in NFL history with 200 wins, along with being the only quarterback to win two Super Bowls with two different teams. For head coach Gary Kubiak, he is the only person to win a Super Bowl as a coach and player for the same organization. Miller was named Super Bowl MVP, as he totaled six tackles, two and a half sacks and two forced fumbles.